Discover new ways to keep your reading up to date. With the Ubook you will always have time for your favorite stories in all formats: whether reading or listening. We bring together culture and entertainment in one place, for you to consume when and where you want, and broaden your reading experience. 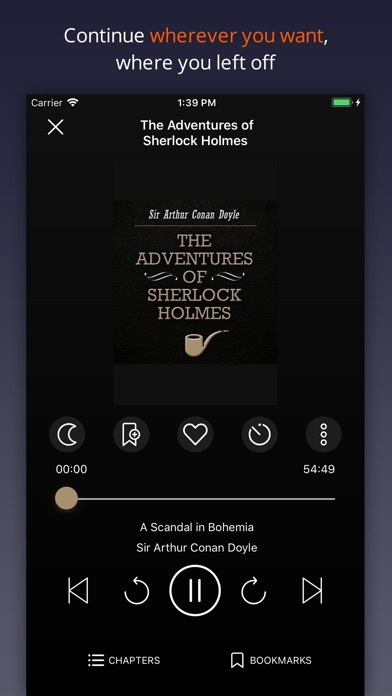 Listen to over 250,000 audio content including books, magazines and podcasts, for all tastes and ages. The narration is made by professionals, with voices of actors, narrators, celebrities and even the authors themselves. 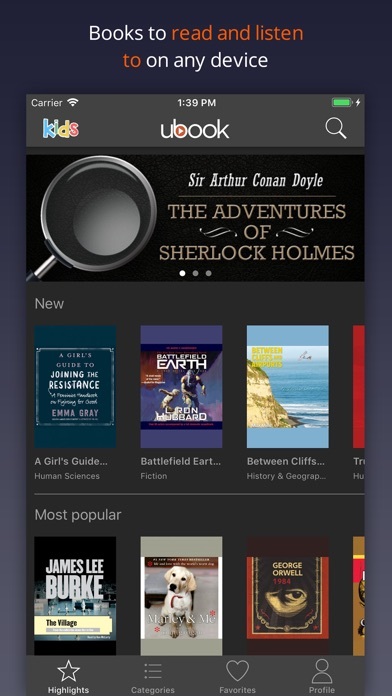 Take over 10,000 e-books in the palm of your hand, with the ability to read on your smartphone, tablet or computer. 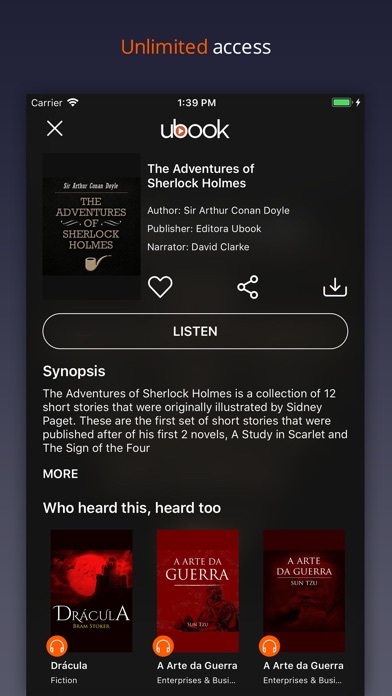 Download the application, sign up, and try reading and listening to your favorite books while doing other activities. After the free period (7 days), you can continue to consume selected content or become a Premium subscriber to have unlimited access to the app. With the Ubook you can read and listen to books on your way to work, while driving, at the gym, waiting for a consultation, or wherever you prefer, turning your idle time into productive hours. Most of the catalog is composed of books by major publishers. There are thousands of bestsellers in Portuguese and other languages, classics, novels, fiction, self-help and more. Also available are the best national magazines and podcasts, as well as foreign content in English, Spanish, French, German and Italian. The place you are in has no wi-fi? Do not worry! When in an internet-based environment, download content to your smartphone, and access any content offline, without consuming your data package. Do not worry about storage space, you can download the complete content or by chapters. Subscribe to the Ubook to have unlimited access to the entire catalog, that is, with a monthly subscription you can read and listen to as many books as you want, as long as you prefer. You can start reading from a smartphone, for example, and continue from your tablet or computer, from the point where you left off. Your data will be stored in your account in real time. Yes, it has a Ubook for all ages! Thinking about providing a secure interface for children, we've created this new feature. 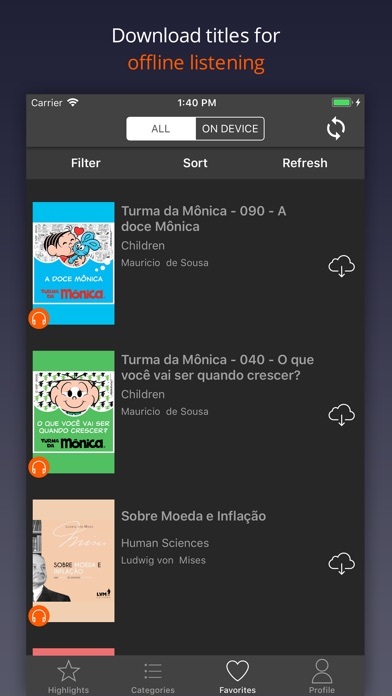 To access, just fetch the child's (baby) icon in the upper-left corner (iOS, which will take you to a fully selected and safe environment for your child in the app home). password "was created for adults to authorize what will be played by the children, and then feel free to let the little readers navigate the app by themselves! - Try our Premium plan for 7 days. - Payment is debited directly from your iTunes account at the time of purchase. - The subscription is valid on any smartphone registered to your Apple account. - The subscription is automatically renewed unless this option is previously disabled (at least 24 hours before the end of the current period). - The automatic debit of the renewal is made 24 hours before the end of the current period. - Subscriptions can be managed by the user and automatic renewal can be disabled by accessing the user account settings after the purchase. - The value of the current subscription can not be returned and the service can not be interrupted in case of withdrawal during the period of validity. by Editora Caros Amigos Ltda.